This past week I spent some time in Orlando, FL. See below for some pictures and restaurant recommendations. 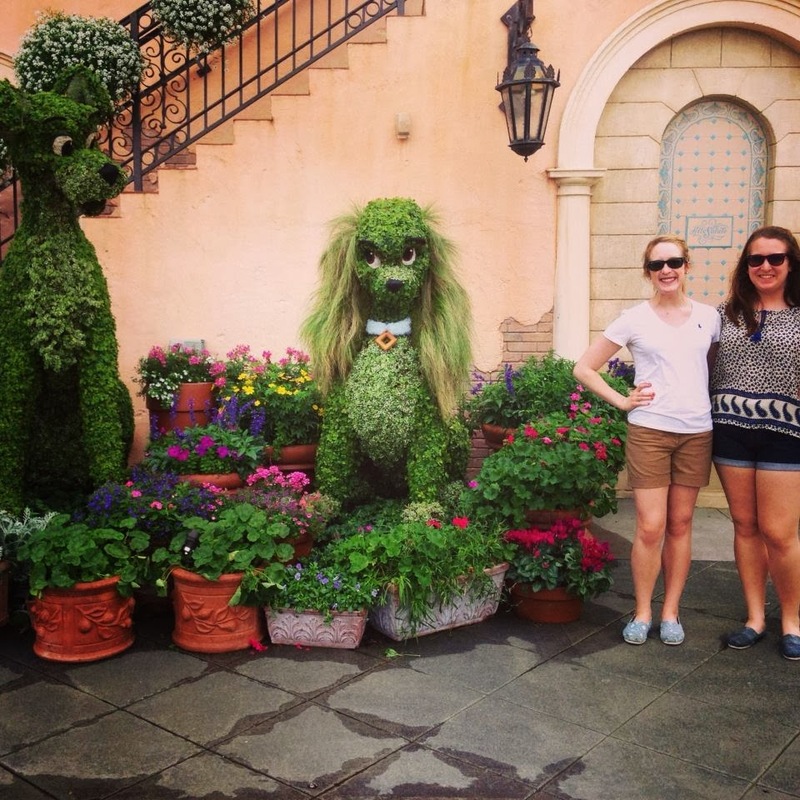 Day 1: We spent the day at Epcot! This is definitely my favorite Disney park. Lots to see and do, but doesn't get as many crowds of kids as Magic Kingdom. Definitely the best place for food lovers----you can eat around the world! We started with street tacos at La Cantina de San Angelo. Kringla Bakeri for traditional Kringla sweet pretzels. Chocolate and coffee mousse at Les Halles Boulangerie & Patisserie. We also had some awesome Werther's caramel popcorn from Germany. We also tried several delicious beers throughout the day. Fabulous French dinner at Monsieur Paul. Highlights included roasted duck breast and the truffle mashed potatoes. I would make a reservation. Day 2: My family and I had a rainy, soggy day at Universal Islands of Adventure. I'm a Harry Potter fan so we spent most of the time in Harry Potter World. We didn't eat much for lunch since we were going on roller coasters, we basically just snacked throughout our time there. For dinner we ate at our hotel. 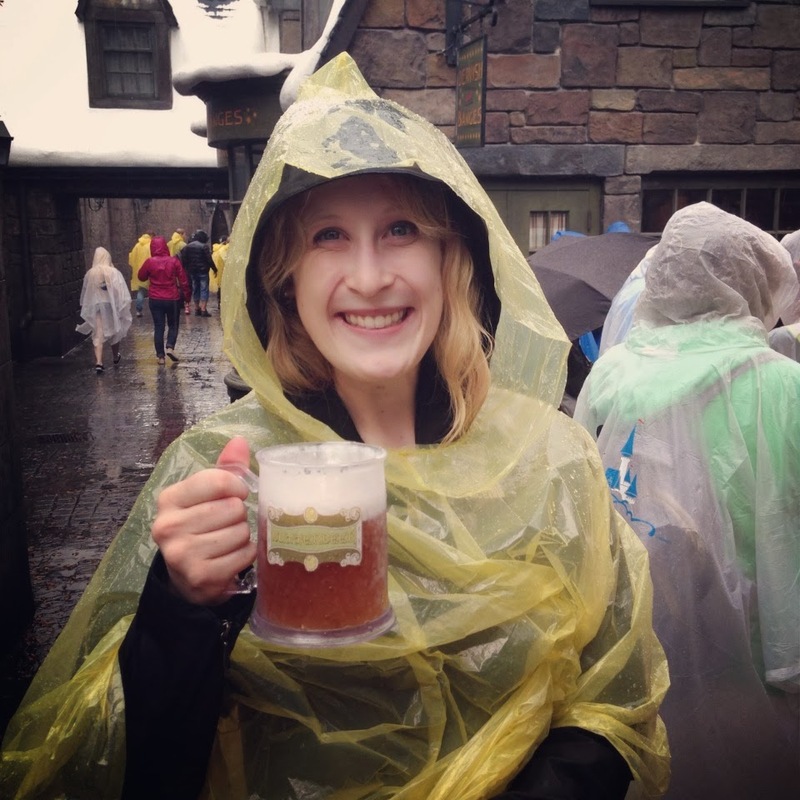 Snacks: Butterbeer! Non-alcoholic, butterscotch goodness. You can get it frozen (slushy form) or regular. Tasted just like I would imagine. For an appetizer we had Antipasti Misti (top right) with cheeses, meats, and olives. They also sliced bread fresh at our table! For dinner I had a delicious tagliatelle with parmesan, mushrooms and truffles (middle right). For dessert we had zeppole italian donuts (bottom right) and pistachio gelato (left). Great restaurant! 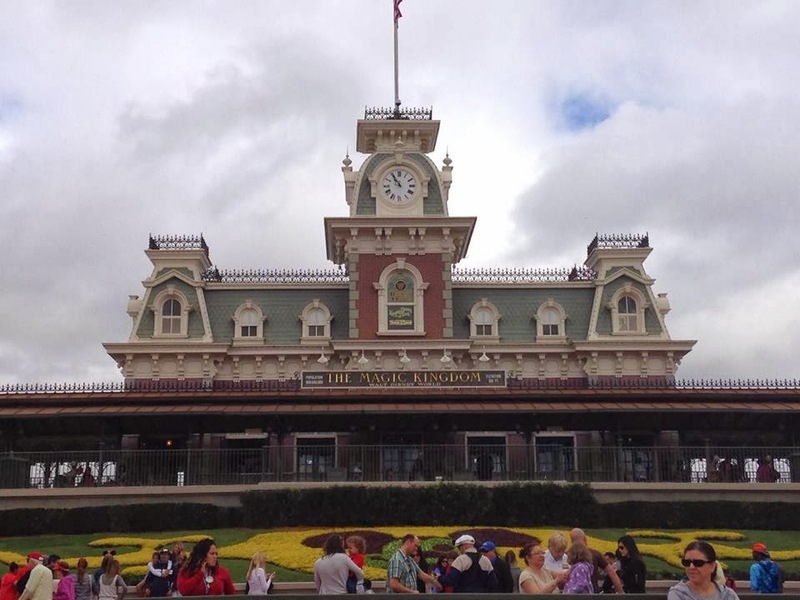 Day 3: We spent the day at Magic Kingdom. It was much colder then predicted and very windy. My mom, sister and I ended up having to buy matching sweatshirts to keep warm and became that family. Lunch: To get out of the cold, we waited for the Liberty Tree Tavern. We warmed up with burgers and soup. Dinner: We were late making reservations so we ended up eating Tony's Town Square Restaurant. 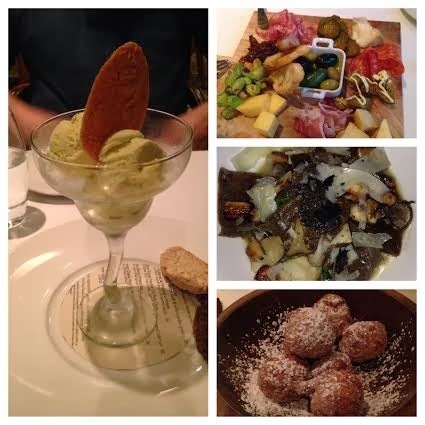 It had pretty basic Italian dishes and large portions. Next time we will try to eat at the new restaurant Be Our Guest. Day 4: We spent our last day out at the pool enjoying the sun. For dinner we went to the Tommy Bahama restaurant. I had the the Thai Scallops and Shrimp with a coconut curry sauce which I definitely recommend. For dessert we decided to celebrate my dad's birthday while we were all together. 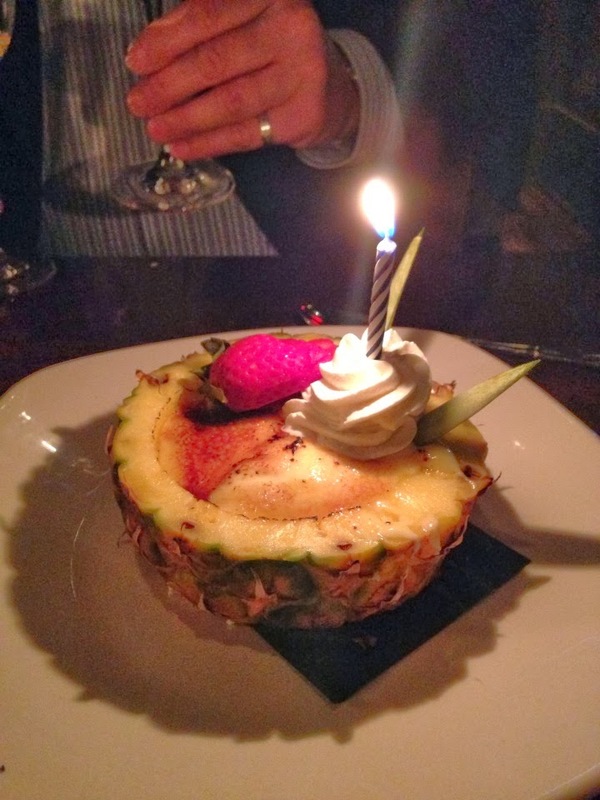 We ordered Pineapple Creme Brûlée served in a sliced of pineapple. So so delicious.